What a great way to kick off our new feature Scents of Summer. For the rest of season we will be featuring products fit for summertime - bath, body, fragrances - if it screams or whispers summer, you’ll see it here. Here’s a scent I could smell while it was still in the box! 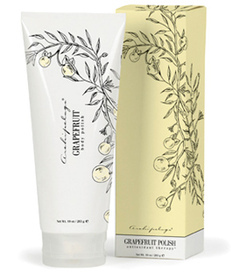 ARCHIPELAGO BOTANICALS' new Grapefruit Collection is all citrus and all refreshing. Each product awakens the senses and gets you ready for your day. Made with premium ingredients and natural anti-oxidants including Grape Seed Extract, mucho vitamin E, Jojoba among others, this collection is one that will stay at the forefront of my dresser. Our picks are the Body Polish ($27/10oz) and the Lip Butter ($12/.53oz). It also comes in the form of everything from a Detox Bath Soak ($30/15oz) to a nourishing Dry Body Oil ($29/8oz). Big recommendation. All @ smallflower.com.